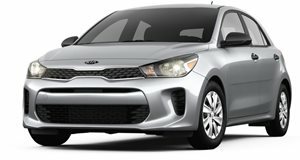 The redesigned 2018 Kia Rio 5-door is offered with a 1.6-liter engine, power outputs are 130 hp and 119 lb-ft. Drive is sent to the front wheels through either a 6-speed manual or automatic transmission. Performance and economy levels are competitive for the class and with a supple ride and upmarket interior the Rio is a strong offering. Standard equipment levels are meagre on the lower LX trim and you will have to step up to at least the mid-level S trim before you get power windows, Bluetooth connectivity or keyless entry. The Top EX trim offers a smartphone compatible 7-inch touchscreen and autonomous emergency braking which is commendable for the subcompact class. 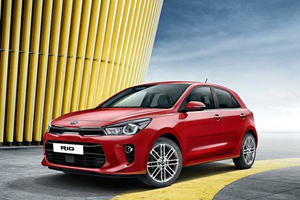 The Kia Rio has been an accomplished offering in the budget car sector for a number of years and the 5-door hatchback body style adds a bit of added practicality to the formula. 2018 sees the Rio range receive a complete redesign and other than a new exterior design there are numerous changes to the interior and running gear too. Three trim levels offer a varying degree of value and equipment levels. The Rio has received a welcome upgrade to the interior quality levels and while it hasn’t quite transformed into a luxury hatchback, the materials are all a step up from what you generally get in the subcompact category. The dashboard and door panels are now covered in upgraded plastics and soft-touch materials and on higher trim models, the large 7-inch touchscreen looks distinctly upmarket compared to some rivals’ offerings. There is enough space for four adults to travel longer distances in relative comfort, both rows offer decent cushioning and as long as the front seats are not pushed too far back, rear leg room is adequate too. The cargo space is about average for the class but the load floor is now a bit wider than before, although while the rear seatbacks do fold down the load area is not completely flat. The new Rio 5-door has a retuned suspension and slightly more weighty steering which helps improve its driving feel and in general this little Kia performs admirably over most road surfaces. Ride quality is much improved and provides excellent bump absorption, it may be a little firm over rougher surfaces but it is never unduly harsh and the Rio compares well to the Honda Fit and Ford Fiesta when it comes to highway driving and refinement levels. 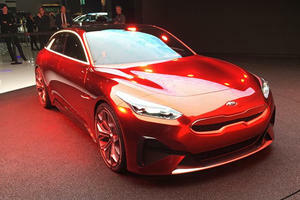 The previous generation 1.6-liter four-cylinder engine has been re-profiled to offer more mid-range power and peak outputs are slightly down at 130 horsepower and 119 lb-ft of torque. Despite this, performance levels have improved and the 0-60mph time is now under 9-seconds which is above average for the segment and there is a choice of either 6-speed manual or 6-speed automatic transmissions. The manual is however only available in the base LX trim. Fuel consumption figures have also slightly improved to a claimed average of 32mpg with either transmission option. Three trim levels are offered, the base LX is the only model offered with the manual transmission and while the standard specification list is not overly generous there are a few notable features such as 15-inch steel wheels, auto-headlights, 5-inch touch screen, tilt adjustable steering-wheel, air-conditioning and a 4-speaker radio with USB port are part of the package. S Trim adds an upgraded 6-speaker audio system with Bluetooth connectivity, Siri Eyes Free, cruise control, center console armrest, power windows, rear camera display, heated and powered exterior mirrors and keyless entry. The top EX Trim adds 15-inch alloy wheels, tilt and telescoping steering-wheel, autonomous emergency braking, front fog lights and a much improved 7-inch touchscreen infotainment system with smartphone integration. The EX Launch Edition package features a partial red leather seat covering. 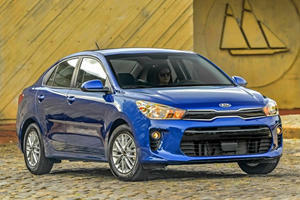 The redesigned Kia Rio 5-door has moved up a notch in ride comfort and interior quality levels and incremental improvements in performance and economy help maintain its competitive edge against other subcompact offerings. Higher trim levels add some desirable equipment although this negates the keen pricing levels of the base models so sticking to the mid-level trim offering may be the best compromise.